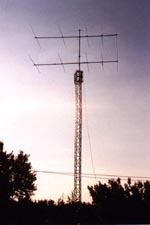 ZX-yagi: Shortwave Antennas, Amateur Radio and more... from Germany! Hi friends, I would like to inform you that the 4 el. 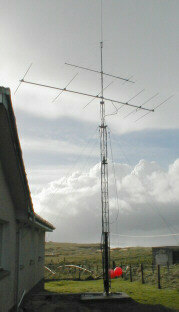 yagi ZX (the best for me) that I bought last year , runs very very well like a thunder !!!! I contacted stations from most wanted countries without difficulty expecially from north and south pacific but.....if it is possible I would like to have more info on the project of the 9 el. yagi. Maybe I'm crazy but I have a lot of space in my holiday home so...................I think I'll buy it. I hope receive your answer as soone as possible. depuis le 11 septembre 2001 je possède une 11-5ITB. J'en suis très satisfais et je tien a dire aussi la qualité de cette antenne. I just bought a ZX MINI-2000 and it is great. I have the antenna set up on a push up mast and worked a UA9 on my first call today and got a true 5-9+ report. I know the gain on the beam isn't super, but the front to back is certainly better than I expected. My Qth is about 300 ft above sea level and just a few more away from the Monterey Bay. Pointing from East thru North the antenna has salt water at its feet and works great. J'ai acheté un balum MTFT et je l'ai installé avec succès. Maintenant, j'aimerai bien en augmenter ses performances, surtout au niveau ROS. wie gewünscht, sende ich Ihnen hiermit eine Foto des neuen Beams für das Photoalbum. Wie Sie sehen, ist diese Antennenanlage sicherlich sehr ungewöhnlich, vielleicht sogar einmalig! Die Montage eines Beams in einem Baum ist bestimmt nicht alltäglich. Bei der Planung eines Beams kam mir der Gedanke den vorhandenen Baum (Kiefer) anstelle eines Masten zu verwenden. 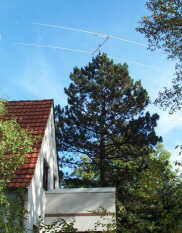 Dieser Baum ist ideal gewachsen, und, was besonders wichtig war, leicht und fast bis in die Spitze zu besteigen, denn die Endmontage der Antenne mußte dort vorgenommen werden. Der Tragemast des Beams, ca. 3m lang wurde mit soliden Holzkalotten am Stamm des Baumes angebracht, ohne diesen aber zu verletzen. Aufgrund dieser Verhältnisse wurde auch bewußt die ZX 20-2 Antenne gewählt, denn größere Beams lassen sich so nicht mehr handhaben. (Gewicht, Boomlänge, Windlast). Etwas akrobatische Verrenkungen waren lediglich beim Abgleich des Gamma-Matches erforderlich! Die Antenne befindet sich 15m über Grund und mit den ersten Testergebnissen bin ich sehr zufrieden und meine auch die richtige Entscheidung getroffen zu haben. Thanks for information! I have the MTFT and it's very very good all HF bands. ZX 6-4 50 MHz beam: Antenna now assembled and seems to be working OK with very low SWR. I am very pleased with the engineering. Please convey my thanks to all concerned for the prompt attention I recieved, I have a long memory Hi ! we used to live in Derbyshire, England and moved here about 2 years ago, so I brought my 60 foot tower with me. Due to the very high winds we have, I now only use one section of the tower as you can see. There is the ZX6-6 6 element ZX-Yagi for 6mtr, a homebrew 9 element for 2mtr (which I will be replacing with something bigger), and at the top is a Diamond F22 for 2mtr, the total height of the tower is about 12mtrs. That is the antennas so far on the tower, there is also a Mosley TA33 in the background ready to be used later. Recently purchased The GP-3 antenna and I'm in need of of extra 18 Meters of PVC insulated copper wire for adding more radials, unable to obtain the above locally. Congratulation on Excellent product good finish and documentation. Hello Ron,I contact KP4EIT today on 6 meter with my 6 elements ZX YAGI with 10 Watts my report 58 in Puerto Rico. I receive the station 53. I have a friend near my house (20 km), my friend doesn't receive the station from Puerto Rico with 5 elements Tonna ! I say "if you want Puerto Rico on 6 m, buy ZX" ! Bye, IVAN Thank you ZX YAGI !!! Just a few comments about my ZX Yagi 6EL. When I purchased it in May of 1998, I did not expect the support that you gave me with the shipping problems that occurred. A customer just does not expect that kind of support here in America. I couldn't believe you even called me from the Netherlands to make sure everything arrived in good shape. Once I got that beauty on the air, I simply could not believe the number of stations, AND countries, that I had never heard before. As a direct result of my ZX Yagi, I have made many friends in Europe from my base station here in Oklahoma. I have owned many types of antennas in my 40 plus years of radio, and I am convinced that there is not a better antenna made than the ZX Yagi 6EL. Thank you for a great design, and for the strong materials and ease of construction that you build into each and every ZX Yagi. It is very important to me, as a consumer, to purchase a quality product, and a real plus to get the service that you provide AFTER the sale. Keep up the good work, and say "Howdy" to the girls in the office. de Willy ON7NW qth: ZICHEM VB BELGIUM JO21MA asl antenna: 40 meters,not so high,with small hills on the side. 73' to all of You. I would like to thank you for the nice antenna you build on my request,the ST5FR. The 5 ITB was an exellent antenna,but this one is absolutly great.The F/B is as you told me is more than 45DB,the forward gain must be more as you told me,because it works like a devil in the pileup. Most of the time,one or two calls is enough, with only 75 watts PEP.